Traveling with kids is no foreign task for this family. I grew up visiting grandparents and traveling on a very regular basis. Now, since my family is so spread out, I have found that traveling is just part of the routine. Although I haven't ventured out with all 4 kiddos yet, I have several trips to FL under my belt with just me and the older 3. I am soooo very excited! Our last trip was taken when Avery was two weeks old. I'm crazy. I know. This time, instead of hitting the road, we are flying. Yay! No matter how you are getting there, there are several items I have found that are mandatory for traveling. Tylenol - Adjust for the age group with the Children's or Infant's version. I can't tell you how many times we have been on vacation trying to locate a store in the middle of the night because someone woke up with a fever or earache. Benedryl - It never fails that when we travel someone ends up stuffy. Whether it's the change of climate or allergies in general, I always travel with Benedryl. Vick's Vapor Rub - I still use the baby version and you can buy it in a small travel size too. It's great for stuffy noses and coughing, which, of course, always happen in the middle of the night. Neosporin To-Go - I love this stuff. It sprays right on so you don't have anything to spread. A perfect size for the diaper bag too. Benedryl Stick - This thing is awesome. I picked up a couple last year and always keep one in my purse and diaper bag. It is great for mosquito bites, bee stings, or any type of itchy rash. The pen size makes it easy to carry and is not messy. BandAids - Scrapes and cuts happen. On a regular basis I am needing a BandAid for someone. Kleenex - The travel packs are perfect for diaper bags, purses or car compartments. I pretty much have them everywhere. From runny noses, to a food that someone doesn't like, they are great to have on hand. Purell - I don't know about you, but when I'm somewhere like Disney, you can't give me enough hand sanitizer. I am pulling it out after every ride and before every meal. Especially when young babies are with you, germs need to stay as far away as possible. 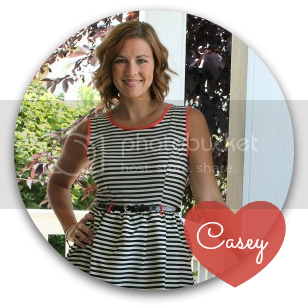 Thermometer - Although not an absolute necessity, a thermometer just gives me peace of mind. I can tell by the touch of a hand if the littles have a fever or not but sometimes it's nice to know how high that fever is. It helps me to gauge my level of panic. Sunscreen - I love the travel version of Coppertone's Water Babies. Its a great size to take on a trip but no too small to use in one day. Chapstick - A must. Where there is a cold there is also chapped lips. I carry one in all my bags but this one for sure. Wet Ones - If you're a germaphobe like me, these are essential for wiping off tables at restaurants, carts or rented strollers. They are antibacterial and come is perfect sized travel packs to carry with you. Remember if you're flying to buy the travel sized bottles so you can carry these items on. If we are in the car, I usually carry full size just in case. But for the most part, the travel sizes will get you buy until you can at least get to a convenience store or pharmacy. 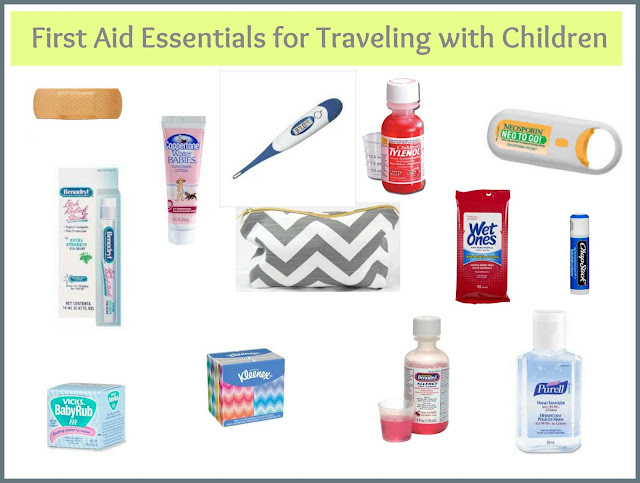 Do you have any favorite first aid items for making traveling with kids easier? And some wine for mom once you reach your destination! Seriously, I hope you enjoy your trip. Disney would be so much fun! awesome things! ill have to keep this in mind, or pin it! lol! thanks for sharing!